Israel. Do Not Trust Obama! How long must men play mind games before they realize, that nothing replaces good old-fashioned truth? How long must cowards be endured, when lives are at stake? Any wise informed mind realizes, that Israel’s existence is at stake. Obama expects Israel to trust Obama with their national security? Hahahahahahahahahaha! That is a most laughable proposition. 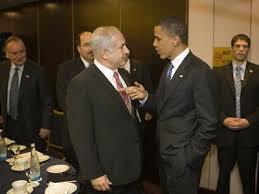 As a very patriotic American, I can assure you, that Obama does NOT have Israel’s back! Dear Prime Minister Netanyahu: I warn you not to trust the Obama administration. They talk a good game, but their actions do not support their words. Mr. Netanyahu, you are right that Obama is playing a dangerous game with Israel’s national security in negotiating with Persia/Iran. Persia’s Moslem rulers are infidels in the strictest sense of the word. Persia’s rulers HATE Israel. Obama and his administration are blind men leading the blind and they will both fall into the ditch. Matthew 12:34 says, “The mouth speaks out of the abundance of the heart.” Persia’s spiritual ruler Ayatollah Khamenei compared Israel to a cancerous tumor that needed to be cut off. Persia’s former president Ahmadinejab said that the regime occupying Jerusalem must vanish from the page of time. An Iranian General recently said their hands are on the trigger to destroy Israel. Listen carefully: these leaders of Iran/Persia are speaking out of the abundance of their hearts. They have hatred in their hearts for Israel. The one thing that precedes murder is hatred and this is a fact. It is one thing to very much dislike someone and their motives, but it is quite another to hate them. People with hatred in their hearts are suspects for future murder. You see, the leaders of Iran/Persia are not interested in the possibility of rehabilitating Israel from their perceived worthlessness; they are interested in murdering the people of Israel. It is what we call genocide. 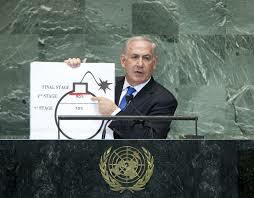 A nuclear weapon could be very useful in Persia’s hands to genocide Israel. I know I used genocide as a verb, and that was my intention. Any wise informed man knows that Persia does not need energy. They are sitting on top of one of the world’s largest proven oil reserves and natural gas reserves and this proves that they are lying through their teeth about their desire to make electricity with their nuclear power. OBVIOUSLY, they desire to make nuclear bombs with which to first genocide Israel and then threaten whomever else stands between them and their goals. But the Obama administration turns a blind eye and thus toys with Israel’s national security; um I mean, national existence. The Jews have been the most targeted people in all of history for extermination. Ancient Persia and Hitler planned to genocide them. The Egyptian Pharaoh sentenced all newborn baby boys to drowning in the Nile. The Babylonians slaughtered them and carried them into captivity. The Romans slaughtered and dispersed them. The Seleucids greatly persecuted them. Google www.simpletoremember.com/articles/a/HistoryJewishPersecution/ for a very long list of Jewish persecution. These are known facts. A wise ruler should be able to figure out, that the Iran/Persia profile fits the description of past atrocities against the Jews; and yet, Obama plows forward with foolish empty negotiations with men who HATE Israel. Give me a break! Obama and his entourage of “treating Jews lightly” men and women are setting themselves and the United States of America up to be cursed. Almighty YaHVeH has spoken and will not take it back: Abraham, I will bless those who bless you, and curse those who curse you. Obama and his entourage, that treats Jews lightly, had better repent while there is still time. Prime Minister Benjamin Netanyahu, I wish you safety and good success in your trip to the United States to address the U.S. congress concerning Israel’s dangerous position from a possible nuclear Iran/Persia. Israel’s Prime Minister Benjamin Netanyahu is being snubbed by president Barack Obama in his upcoming visit to the United States. The Obama administration announced, that President Obama will not be meeting with Prime Minister Netanyahu during this visit in March. Netanyahu has accepted Speaker of the House of Representatives John Boehner’s invitation to speak before congress March 11. President Obama is fiercely angry, because he was not told about this invitation in a timely manner and was told by the wrong people. People in the Obama administration are carelessly and foolishly referring to this as a “spit in the face”. Poor Mr. Obama! He didn’t get his way and now he is going have a little temper tantrum, but let us consider the matter more carefully. Only a few weeks ago in October of 2014, an Obama administration official referred to Prime Minister Netanyahu as a “chickenshit”. Earlier in the Obama administration, when Netanyahu and Obama were in a meeting at the White House, it is commonly reported that President Obama suddenly exited the tense meeting to go have dinner with Michelle and his daughters, not bothering to invite Netanyahu to eat with them, and this is a kind version of what took place that evening. President Obama has unduly put huge public pressure on Prime Minister Netanyahu to stop all construction in areas that Israel legitimately gained in war instigated by Muslims/Arabs. The Obama administration has been playing a dangerous diplomatic game with Iran concerning their nuclear weapons program. The Iranians/Persians obviously are busy building a nuclear bomb and delivery systems for said bomb, while threatening to destroy Israel. The Obama administration is blatantly putting Israel at risk of extinction, because there is no way that the Iranian/Persian mullahs are going to halt their efforts to wipe Israel off the map. This is an existential threat to Israel and President Obama is treating the matter lightly. Of course Israel is very nervous about this situation. Would you be nervous, if someone was openly saying that you and your family should killed, and those around you went about their daily routines as if nothing was going on? President Obama has brazenly spat in the face of Israel, Canada our friend to the north, Christians, the U.S. military, the Prime Minister of Russia Vladimir Putin, Republicans and others, apparently reminding his adversaries that he is quite the man. The fact of the matter is this: the United States has a system of checks and balances. We have three exclusive branches of government: executive, legislative and judicial. Not one branch of the U.S. government is required to get permission from the other two branches in order to do its job. This design was put in place by our founding fathers for the express purpose of preventing a single person from doing things that are not in the interest of our nation. President Obama has repeatedly done things, that are not in the interest of the people of the United States of America; therefore, it is perfectly fitting, that Speaker of the House John Boehner countered President Obama’s careless and dangerous antics with Iran. Inviting Prime Minister Netanyahu to speak before congress is very responsible leadership by Speaker Boehner in checking and balancing President Obama’s careless leadership. It is about time, that someone had the guts to mitigate the damage President Obama is regularly visiting upon our nation. Finally someone has taken President Obama to the woodshed, and pointed out to him that he presides over merely one of the three branches of government. Proverbs 29:2, “When the righteous are in authority the people rejoice, but when the ungodly reign, the people mourn.” President Obama needs to humble himself before the Almighty while there is still time. A grown man should put away childish things. Mr. President, the day is coming in the which you will stand before Almighty YaHVeH and give an accounting of your life. All of us will give an accounting and not a single soul will escape this responsibility. YaHVeH refers to Jerusalem as the “apple of His eye” in Zechariah chapter two and shows His continued attention to the well-being of Judah. Those who have spoiled Israel will be dealt with harshly. You don’t have to agree with everything Israel does, but for the sake of yourself and for the sake of the United States of America, behave yourself very wisely in dealing with Israel.